If you are watching the MTV Video Music Awards right now, chances are that either you or someone you know is also Tweeting about it. Some trending topics on Twitter right now are “lip synching” (Oh, Bieber) and “Drake better win”. But if you want to supplement your watching during commercials, open your laptop and point it to the MTV VMA Twitter Tracker. It is a gorgeous visualization of VMA-related Tweets created by MTV, Twitter, and the excellent folks at Stamen Design (who have also done visualizations for Digg and Crimespotting sites). 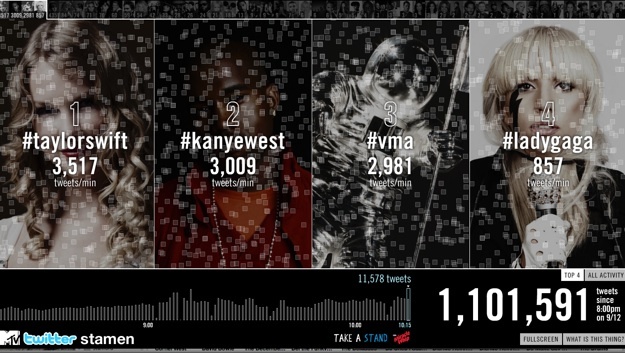 As of this writing, there are 1.3 million Tweets about the MTV VMAs in the past three hours since it started. The Twitter tracker ranks artists by number of Tweets per minute. 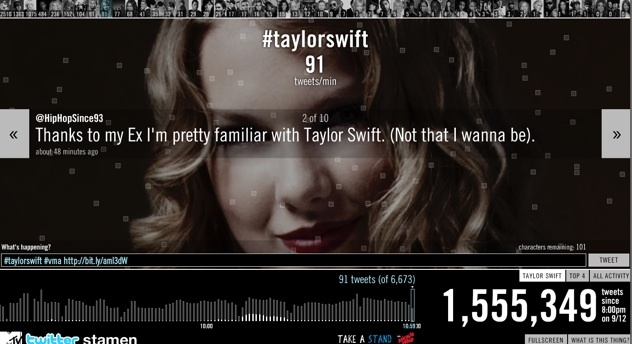 At one point, Taylor Swift was dominating with 3,517 Tweets per minute, followed by Kanye West (3,009) and Lady Gaga (857). It changes all the time, obviously, depending on who is on stage. Thanks to my Ex I’m pretty familiar with Taylor Swift. (Not that I wanna be). Thumbnails along the top of the tracker let you click on down the line to other artists. All in all, it is very entertaining, almost more so than the VMAs themselves.